Pampered is what you will be in this beautiful new Santa Fe style property located in Fountain Hills, AZ (just 1/4 mile east of Scottsdale) on the Eagle Mountain Golf Course. This boutique resort hotel has 42 deluxe rooms and suites with fireplaces, private decks and 2 person whirlpool tubs. Every room has a private deck or patio facing the 60 mile views of mountain terrain and the Sonoran desert. The large grounds include a pool, spa, exercise facility, meeting rooms and a magnificent lobby building known as "The Lodge". The grounds include over 6 acres of native desert vegetation and adjoin the championship 18 hole golf course. Guests may reserve tee times up to 90 days ahead of play. 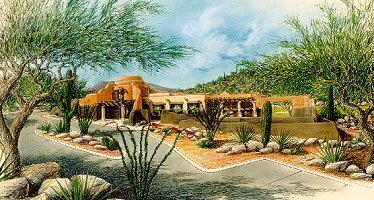 The structure is contemporary southwestern and the rooms are decorated in the finest Santa Fe furnishings all custom made for the Inn. The Inn is a unique hideaway where you can relax in complete privacy while enjoying luxury. Check our home page for special internet rates, a virtual tour, and lots of things to do in the area. This and other Scottsdale Bed and Breakfast Inns can be found here in The Register.